A man who authorities say walked into a Ladson pawnshop and asked to look at an AR-15 rifle before inserting a loaded magazine and opening fire was denied bail during a Wednesday night court appearance. Gregory Franklin Westfall, 36, faces four felony counts in connection with Tuesday's incident at Big Bucks Pawn, 113 College Park Road, according to affidavits. "The defendant planned this action out with the intent of causing social change," the affidavits said. In all, Westfall was charged with two counts of attempted murder, and one count each of possession of a weapon during the commission of a violent crime and armed robbery, said Chief Deputy Mike Cochran, a Berkeley County Sheriff's Office spokesman. His last known address was West Landmark Street in Boise, Idaho. 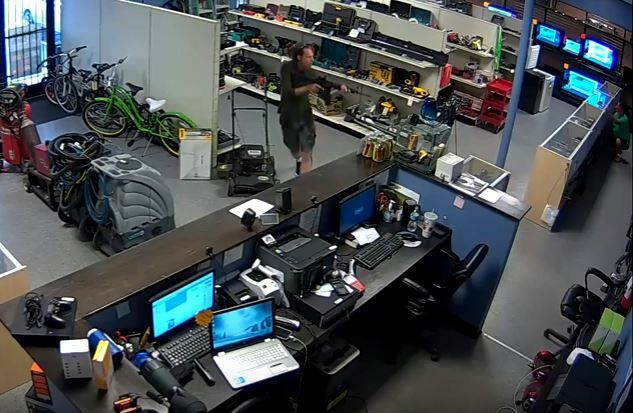 The Sheriff's Office also released surveillance video footage from inside the store at the time of the shooting. An investigation into the incident is ongoing, according to Cochran, who added that Westfall moved to South Carolina sometime in the last month but hadn't established residence. Deputies were called around 4:20 p.m. to the shop, he said. They learned that a man came into the store and asked to see an AR-15 rifle. Deputies found him in a wooded area behind the pawnshop, he said. He still had the AR-15 rifle in his possession and was taken into custody without further incident. The Charleston County Bomb Squad was called to investigate the contents of Westfall's Dodge Ram pickup truck and a book bag, he said. The Bureau of Alcohol, Tobacco, Firearms and Explosives, and the FBI were also called to assist.